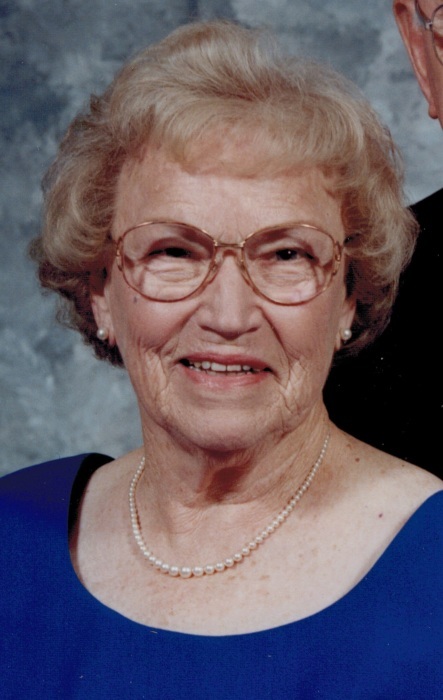 Doris L. Dohr, age 96, of Delta, passed away at the Swanton Healthcare, Tuesday, May 22, 2018. She was born in Toledo on March 11, 1922 to the late John H. Terwilliger and Louise E. (Goodwin) Terwilliger. Doris was a 1940 graduate of Monclova High School and later attended Davis Business College. On June 5, 1941 she married George W. Dohr who passed away in 2005. She began her working career as a secretary with International Harvester and then as a private secretary for Owens Illinois for over 30 years. After retiring she volunteered for many years at St. Luke’s Hospital in Maumee. She served as a Cub Scout and Boy Scout leader, 4H advisor and was a member of the American Legion Auxiliary for over 50 years. Along with her parents and husband, George she was preceded in death by her brother, Wayne Terwilliger during WWII; sister, Althea Cuneo and son-in-law, Roger M. Lauber in 2003. She is survived by her daughter, Sharon Lauber of Delta; son, Ronald (Jan) Dohr of Perrysburg and seven grandchildren. Friends will be received from 2-4 and 6-8 PM on Friday, May 25, 2018 at Barnes Funeral Chapel, 5825 St Hwy 109 in Delta with a American Legion Auxiliary service beginning at 7:30 PM. Funeral services for Doris will be held at 10:00 AM on Saturday, May 26, 2018 at the Delta United Methodist Church, 101 Northwood Dr., Delta, Ohio 43515 with a luncheon to follow at the Delta American Legion. Pastor Donald Krieger will be officiating. Entombment will be held at 1:30 PM on Saturday in the Mausoleum Chapel at Highland Memory Gardens in Waterville. Those planning an expression of sympathy are asked to consider the Delta American Legion Auxiliary, 5939 St. Hwy 109, Delta, Ohio 43515 in her memory. Online condolences may be sent to the family through our website at www.barnesfuneralchapel.com.